Important information below about the Moody’s Mega Math Challenge listed below … download and print the fliers for your classes! Since the New Mexico Council of Teachers of Mathematics plays such an important and influential role in promoting math education, I am writing to see if you could help spread the word to teachers and educational professionals in your region about a great FREE contest. We would love to be able to reach out to attendees at an upcoming conference or general promotion by sending flyers, freebie mechanical pencils, and a few door prizes. 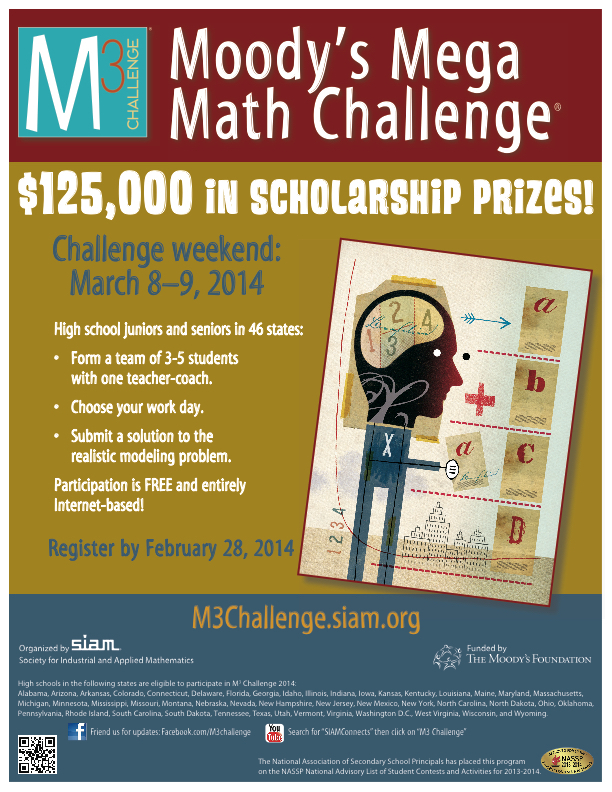 Moody’s Mega Math Challenge (http://m3challenge.siam.org) is an Internet-based, applied math competition for high school juniors and seniors. Now in its tenth year, the competition is free to register and participate, and is open to high schools in 45 states and D.C. New Mexico became newly eligible for the Challenge just last year, and we are excited about drawing a great turnout from the state. Approved by the NASSP for listing, the contest awards scholarships totaling $125,000 to winning students toward the pursuit of higher education. Working in teams of three to five, participants solve a realistic math modeling problem in 14 hours. For instance, last year’s applied problem asked students to quantify school lunch nutrition and taste, a topic that stems from concerns surrounding childhood nutrition. Past years have also asked students to quantify America’s plastic waste to determine the best recycling methods for U.S. cities, and to develop math models to improve the Census count, for example. This real-world focus introduces applied math to students as a powerful problem-solving tool, and as a viable and exciting profession. I hope and anticipate that you will consider promoting this worthwhile contest; we share the same end goal of promoting math education and enhancing classroom learning. If you are willing, please send me an estimated number of attendees, a shipping address, and date by which materials should arrive. We would happy to overnight the package if needed as well.